Spacious 5 bedroom property with spectacular ocean views , private beach. This brand-new custom home combines a fabulous, chic lifestyle with breathtaking views and all the creature comforts. 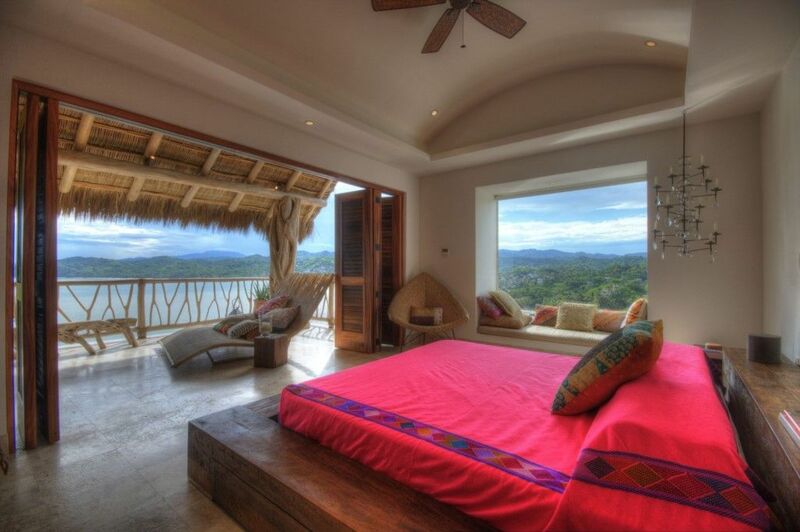 Casa Pura Vida is at one with nature and seeks to incorporate all the natural elements. Reach out and touch the tree tops! This spacious 3-level home makes use of natural materials and plants native to the verdant jungles of Nayarit. This is a family home with wonderful spaces and places for everybody to relax, play, socialize and wonder at the abundance of nature around you. Each of the 5 bedrooms is decorated in a funky boho style coupled with comfort and the sound of lapping waves in the background. The ample bathrooms incorporate natural materials such as wood and stone and are equipped with luxury toiletries. Sleeps 2 – King-size bed. Walk out to the main terrace which offers stunning vistas. En-suite bathroom with tub plus indoor and outdoor showers. Safety deposit box. Sleeps up to 7 – Four Twin beds + futon. Bi-level room with play area. En-suite bathroom with indoor shower. Sleeps up to 5 – Two Double beds + pull out. Suite opens up to the large pool patio which offers fabulous views. En-suite bathroom with indoor and outdoor showers. Sleeps up to 3 – King-size bed + pull out. Opens up to the large pool patio which offers fabulous views. En-suite bathroom with shower. Sleeps up to 4 – One Double + two Twin beds. En-suite bathroom with shower. Private patio. ALL BEDROOMS INCLUDE HOTEL-QUALITY SHEETS, BEDDING AND TOWELS, FLAT SCREEN TV, LUXURY TOILETRIES, HAIRDRYERS AND BATHROBES. With 3 floors of spacious indoor/outdoor living, this home encourages large groups and is set up for entertaining. The décor is comprised of eco-friendly materials cleverly matched with bright boho textiles, oriental flavors, whimsical artifacts and colorful dream-catchers at every corner. Unique architecture, stunning location, secure. 4 full time staff and access to all Punta Sayulita amenities. All Bathrooms have marble vanities, local stone floors and walls. L'occitaine amenities are used throughout all bathrooms. The home has a large infinity pool. additional pools are available for use at no additional cost at the Punta Sayulita Beach Club. Punta Sayulia is located 3 miles from the village centre of Sayulita. Punta Sayulia is an exclusive, custom home, private, gated community with its own beach club, gym, spa, private beach, swimming pools and concierge service. Easy access to Sayulita village, shops, restaurants, surfing, water sports and night life.